Shortly after moving to Bratislava, Terezia's brother Tony told us that locals pride themselves on their ability to find insanely cheap lunch menus. In fact, it's quite common to find 2-course lunch specials costing as little as €3,50. According to Tony, most locals won't even think about spending more than €4,00 on a lunch, and even that is pushing it. These lunch specials typically include a bowl of soup, a main course, and occasionally a glass of Kofola. Some people decide where they want to have lunch by going to this website - http://www.obedovat.sk/bratislava/Lokalita_1_Bratislava_I. - which lists the daily lunch specials of all of the restaurants in a particular area. Needless to say, for both Americans and Slovakia's westerly European neighbors, these specials are dirt cheap! 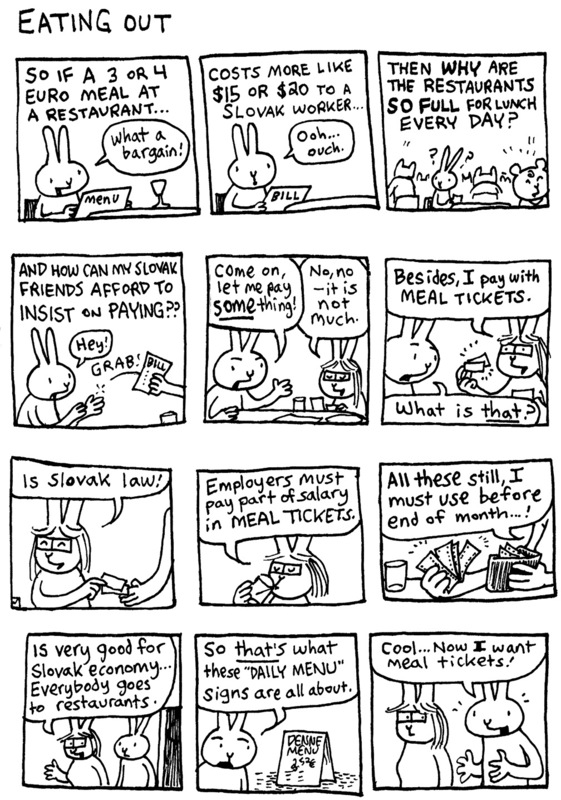 However, when viewed in relation to how much the average working Slovak earns, they're actually not as hot of a deal as they seem, as is nicely illustrated here and here. The voucher or ticket allow you to consume a main meal in a wide range of restaurant or bars. This can solve in a fast and effective way, the obligation established by the law for employers to provide meals to its employees. At the same time helping to improve the social environment in the workplace through financial and tax advantages. I have also seen people using gastro listky at grocery stores like Tesco. But with gastro listky, workers are not getting a totally free lunch. The employer typically covers 55% of the monthly allotment, while the rest is deducted from the employee's paycheck. However, that's still not a bad deal, as it means the employee is spending €36 per month on lunch rather than €72, which makes going out for lunch a slightly more affordable prospect for many people. But wait a minute - 45% of €3,60 may be an okay deal for workers, but how do these crazy cheap prices affect restaurants? On one level, it does ensure that most restaurants are full during lunchtime, which also has the benefit of helping the local economy. But even though the average wage in Slovakia is significantly lower than in most Western European countries (less than half! ), that doesn't mean food is proportionately less expensive. As a result, restaurants really have to stretch their ingredients and exercise a little creativity when coming up with a dish for which they can charge €3,60 and still make a profit. While some restaurants dish out lunch specials that are truly and surprisingly delicious and filling, others seem to scrape the bottom of the barrel for old crap that they want to get rid of, the results of which are like having dreadful cafeteria-style shlop dumped onto a plate. (Also, restaurants lose a bit of money when they cash in the gastro listky. The companies that issue them take a small cut, which is how they make their money, and which obviously further decreases whatever profit the restaurant is making). And asking locals for tips or judging a restaurant by how crowded it is will not always work. For example, Tony told us many of his colleagues at IBM absolutely love this restaurant near the Danube called Be About. When Terezia and I went to check it out, the place was so packed you needed a shoehorn to get inside. We snatched the last free table in the joint, and saw people literally lining up at the door behind us. The waitresses appeared harried and frazzled, while the noise level indicated a happy and boisterous clientele. However, the food was relentlessly awful (beer-battered chicken that tasted more like dish soap-battered chicken), while our server kept bringing Terezia the wrong dishes. She even charged Terezia for the slightly more expensive lunch special that she didn't order, and Terezia had to go find a menu to prove to her that she'd made a mistake with the bill. There was NOTHING about this place that could ever compel us to go back, and yet it was a freaking madhouse! Strangely, a restaurant called Omama, which has every square inch of its walls covered in these amazing old advertisements, has served two pretty good meals out of three (that third one was not so good), and while there are always some other people there, it's never bursting at the seams like the dreadful Be About. It has infinitely cooler decor, better food, and somewhat friendlier service, but somehow, the dreadful Be About is the place that's always packed. I just don't get it. Tony thinks that most people just don't really care. They're happy to find any cheap lunch that's at least edible, and it's an excuse to get out of the office for an hour. But, Be About's specials aren't any more expensive than Omama's, so who knows? Maybe people prefer Be About's trendy night club ambience, or perhaps the two good meals we had at Omama were a fluke? (Another popular place, called Pulitzer, tends to serve better than average food, has nicer than average decor, and fills up quickly, although their specials hover at the €4 range). The current crop of trendy, swanky high-end restaurants, like Le Monde or Flowers, offer lunch specials as well, but typically in the €12 range, which is still a good deal considering how much more you'd have to pay for the same dish at dinner. But this also means you're probably only going to see locals of the well-heeled variety eating at these places. If you want to take advantage of cheap lunch specials, it's imperative that you get to these restaurants early. Many of them fill up completely by noon, and some places run out of their specials by 12:30. But if you want eat lunch as the Slovaks do, you'll start keeping an eye out for these cheap lunch specials, scouring the menus that are always posted out in front of the restaurants.